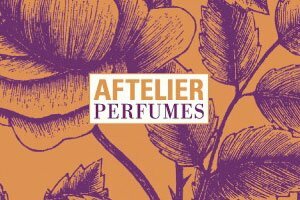 Aftelier is the Berkeley-based indie perfume house of Mandy Aftel, one of the early adherents of artisanal natural perfumery and the original founder of the Natural Perfumers Guild. Aftel originally became interested in perfume while researching material for a novel, and launched her first fragrances in 1995 under the name Grandiflorum Perfumes. Aftelier was established in 1997. Aftel is the author of several books on perfumery, including Essence & Alchemy, Scents & Sensibility and Fragrant: The Secret Life of Scent. Her 2004 book Aroma, co-authored with Daniel Patterson, is about cooking with natural essences (see article The Perfection of an Ingredient: a Perfumer in the Food World). The Aftelier website sells a number of ready-made fragrances as well as a selection of essential oils. Other botanical products include scented teas and a collection of chef's essences for cooking. In 2017, Mandy Aftel opened the Aftel Archive of Curious Scents in Berkeley. See reviews of Aftelier Cepes & Tuberose, Clean Well Hand Wash Ginger Bergamot, Ancient Resins Body Oil, Chocolate Saffron Body Oil, Organic Ylang Face Elixir and Honeysuckle Face Elixir. Recent releases include Tango and Orchid (2006), Fir Solid Perfume (2007), Cognac (2007), Parfum Prive & Muse (2007), Cassis (2008), Lumiere (2009), Trevert (2009), Candide (2010), Honey Blossom, Memento & Wildflowers (2010), Haute Claire (2011), Secret Garden & Oud Luban (2011), Sepia (2012), Wild Roses (2012), Oud Luban Extrait (2012), Cuir de Gardenia (2013), Palimpsest (2014), Bergamoss (2015), Vanilla Smoke (2015), Memento Mori (2016), Amber Tapestry (2016), Curious (2017), Velvet Tuberose (2017), Antique Ambergris (2018), Alchemy (reissue, 2018). Through the website (see below), where you can also find a full list of retail locations. See all posts on Now Smell This tagged Aftelier or Mandy Aftel. Read an interview with Mandy Aftel at Bois de Jasmin.